Adam Air hit the headlines again last week and again it was for all the wrong reasons. If you recall, we had one who flew without navigation back in Feb 2006 . Then it was a horrific crash last month killing 102 people on board. And now we have one who did a "hard landing" but were lucky to escape without suffering any fatalities. The plane itself didn't fare so well as it was bent all out of shape as a result of the impact. 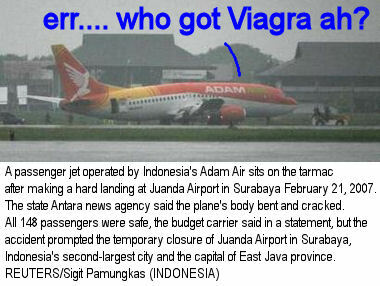 Now before everybody start the witchhunt and burn Adam Air on the stake, I have to say this. It is unfair to single out Adam Air for crucifiction. AFP was quoted as saying "Public and private Indonesian airlines have been repeatedly criticised over their poor safety records, repeated delays and bad management." It just so happened that Adam Air is the unfortunate one to get caught with its pants around its ankles. I think this plane write-off liao. Probably take it apart to salvage for spare parts. Either that or quickly repair it with a fresh coat of paint then diam diam sell to some SpitLand airline. Speaking of SpitLand airlines, HiaoAuntie showed me this blog entry by Cocka Doodle where Spitland pilots ngeh ngeh flew a non-air-worthy plane all the way to Germany, even if it meant using seat belt extension to hold the engine fan blades together. Anyway, as I had done so earlier, it's time to update Adam Air's logo again. Jaslyn: Yeah. You mentioned that before. Tell him don't scared lah. Adam Air won't crash one. They just land damn hard only. LOL. "We didn't land hard. The ground rise up faster than we expected." Use 5deg nose up for initial flap settings. Use 2.5deg nose up for flap 30. For flap 30, start with 55% N1, then adjust as required. A firm landing in the TDZ is a good one, a smooth landing outside the TDZ is bad - despite any comments from the cabin crew. ihawk98: I was told by a commercial pilot friend that landings during wet weather tend to be harder. He said that this is deliberate in order for the wheels to be able to squeeze out all the water underneath. That way, the wheels can gain traction with the runway and not slide off, hence compromising control. Ihawk98: I wasn't aware that the B737 was nicknamed the pig too. All along I thought that Pig was the nickname of the F111 military fighter jet. Jaywalk: actually, the B737 has many nicknames, Pig being one of them only. Here they are: B737: Tin mouse, Maggot, Pocket Rocket Socket, FLUF (Fat Little Ugly F**cker), Light Twin, Baby Boeing, Fat Freddy, Guppy, Pig, Bobby (BOeing BaBY). Ihawk98: I think I read it somewhere that the Airbus 319 is nicknamed the Minibus. Cute!